Every kid likes chicken. And every kid likes cornflakes. So the combination of the two is a match made in heaven! 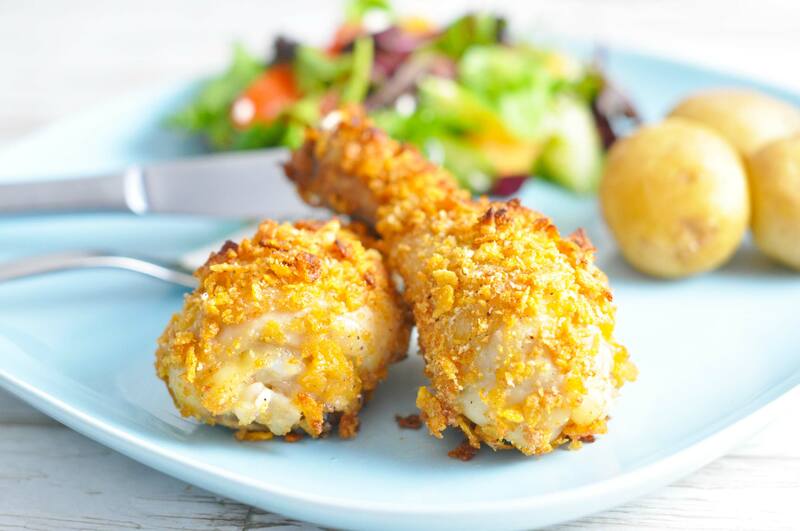 Instead of breadcrumbs, we've coated the drumsticks in cornflakes and parmesan, and it's not bad at all! Try for yourself. 2. Crush the cornflakes in a bowl with your fists and mix with parmesan, salt and pepper. 3. Brush the drumsticks with a bit of oil and coat in the cornflake mix - press the drumsticks into the cornflakes proper, so it sticks. Pop them in a baking tray and if needed, sprinkle some more cornflakes on top. Ovenbake for approx. 30 minutes, or until the juices run clear, and the meat is white without a trace of pink. Remember to wash hands and utensils. 4. Boil the potatoes in a pot with generously salted water. 5. Wash the lettuce, apple, cucumber and tomatoes and cut them in bite-sized chunks. Mix together and sprinkle with dressing on top. This is a perfect dish to make with your kids. Let them crush the cornflakes and coat their own drumsticks in the very kid-friendly coating - just remember to thoroughly wash hands and utensils both before and after. You can absolutely buy a tub of grated parmesan, but it's much cheaper to buy a whole piece and grate it yourself. The slightly cheaper version called Grana Padano will do absolutely fine as well!